Karambit knife for sale at wholesale price. This cool karambit pocket knife has a fast opening spring assisted action. Karambit pocket knife for sale at wholesale price. Cool karambit pocket knife with fast opening spring assisted action combination makes it a deadly pocket knife. The knife blade is small yet it is the legal blade length. The overall open length of the knife is 8.25 inches. 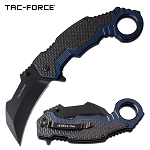 Blade is 3 inch long and blade material is 3cr13 steel karambit design blade. 5.75 inch two tone anodized aluminum handle is very good size for a comfortable handle grip. Pocket clip is attached to the handle back.